I recently bought the Canon EOS R with the RF 24-105 lens as an upgrade from my 60D and wanted to try it out in the Japanese garden in my hometown (The Hague in The Netherlands). This was one of the few photo's i could take because the garden regrettably closed soon after I arrived and wont open again this season. I must say that the camera and lens work great and seem to produce really good images. Great colour and backlighting Bas. "contra joure" lighting I think it's called which means against the light.I am always looking for these shots. Thank you! The colors are strait out of the camera and I also like the 'contre joure' effect :) It took me a while to start seeing the flares that can occur as an feature in stead of an lens failure. It's a shame the garden won't be opening again for the rest of the season... that seems silly of them. Momiji are my favorite subject in Autumn. I like the use of light, but it seems a little busy. It can be hard, but it's usually a good idea to find one or a few subjects that are separated from the rest of the colours. Using a longer focal length with a wide aperture is a good way of doing this, if you have a longer lens. I typically use 200-300mm for these kinds of shots. 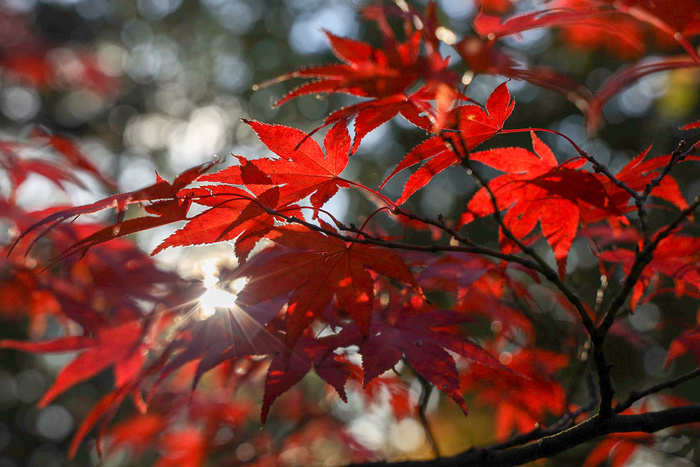 I hope you're able to find more momiji trees outside the garden! The garden is run by volunteers and the season is also almost over here so I understand their decision. I understand what you mean by 'busy' and I will certainly give it a try. Ah, that makes sense. Hopefully you can find more more autumn colours elsewhere! The autumn colour season hasn't even kicked off here in Tokyo, yet, haha.